Antonio Corral Calero, Moroccanoil Artistic Director, created free-spirited braided looks for the show, which was inspired by fantasy street style and a cool sense of personal individuality. 1. He used Moroccanoil Treatment to condition the hair and add a natural looking shine. 2. Then, he sprayed Moroccanoil Heat Styling Protection to shield the hair from the blow dryer and to add hold. 3. Next, he saturated hair with Moroccanoil Volumizing Mousse, blow dried it straight, lifting hair at the roots with his fingers to create a natural-looking texture that wouldn’t look too polished, and added hair extensions for models with finer hair. 4. After making a center part, he pulled the hair back, let it sweep over the ears, and allowed any loose strands to fall forward. 5. Calero gathered the hair at the nape of the neck, made two wide loose braids, and crossed them in opposite directions. 6. He then brought them forward to meet at the top of the head, blended them and pinned to hold. 7. For a more natural street look, he loosened the braids, pulled out a few wisps, and released several more strands from the side of the hair to fall forward. 8. He set the style with a light mist of Moroccanoil Glimmer Shine Spray. 1. First, he applied Moroccanoil Treatment to condition the hair to condition, and then sprayed on Moroccanoil Heat Styling Protection to hold and protect strands. 2. After saturating the hair with Moroccanoil Volumizing Mousse, he made a center part, and pulled back the hair, letting it arc over the ear, allowing any loose strands to fall free. 3. Then, he gathered the hair mid-head, loosely braided wide lengths of hair, and wrapped the braid back into itself to create a long, loose triangular chignon. 4. He pulled and separated the hair throughout the chignon with his fingers to widen it and give it a freer, more whimsical look. 5. He finished with a light misting of Moroccanoil Glimmer Shine Spray. The inspiration for Ann Yee’s clothes came from Black Mountain College, a beatnik liberal arts college founded in the 1930’s that was a unique educational experiment for artists and writers and an important incubator for the avant garde. “Ann wanted a progressive style to complement her collection. The look is woodsy and idiosyncratic in spirit, with a dim romantic undercurrent,” said Allen Ruiz, Aveda Global Styling Director. 1. First, he prepped with Aveda Pure Abundance Style Prep and blow-dried with fingers directing hair away from face. 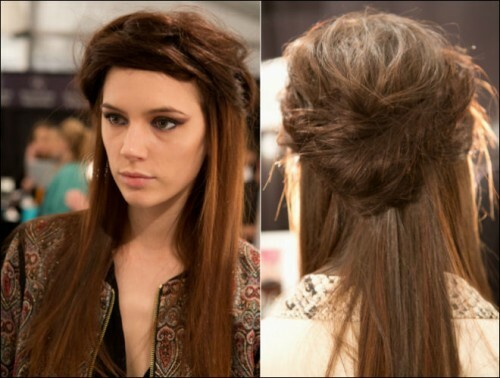 This added the texture and volume needed to create this look. 2. He misted small triangular-shaped sections of hair with Be Curly Hair Spray. 3. Working horizontally from the nape, he wrapped each section of hair around an extra-large U-pin in a figure-8 pattern, and secured each with a small clip. 4. To do this yourself, if you don’t have U-pins, twist pieces of tinfoil into a U shape. The foil will conduct heat just as well as the U-pins. 5. He then held each section with a flat iron for 15 to 20 seconds to set the shape. Once cool, he gently released the pins and brushed hair with a wide-toothed comb. 6. Ruiz backcombed a few sections on the top and sides of the head to create volume, working from the hairline back to the crown and just above the ears, carefully maintaining some definition in the curls above the forehead. 7. Using his fingers, he gently directed hair back and away from the face and then divided into two sections as if to do pigtails. 8. He tied these sections in a knot at the nape, tucking ends while folding hair toward the center to create a twist. 9. He secured with bobby pins and finished with Aveda Control Force Firm Hold Hair Spray. 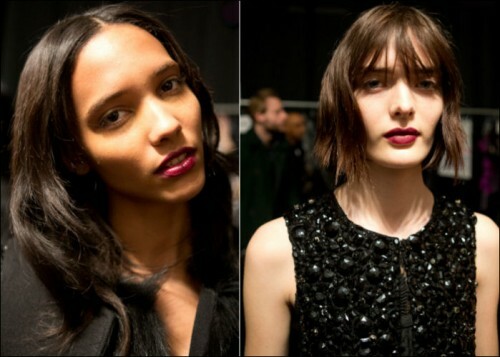 Hairstylist, Peter Gray, created the looks for the Badgley Mischka show, which was inspired by Hitchcock’s femme fatales – Kim Novak, Eva Marie Saint and Grace Kelly – the paradox of their cool surface and inner fire. 1. He applied Moroccanoil Treatment to condition and add a lustrous depth to strands followed by Moroccanoil Heat Styling Protection. 2. Then, he used Moroccanoil Volumizing Mousse from roots to ends for soft volume and hold. 3. Gray blow-dried hair straight with a paddle brush to create a soft, smooth styling foundation. 4. After making a horse shoe shaped section (from each temple to the crown) and pinning it on top, he started to design the reverse-braid. 6. He then started to create the swirling effect on top of the head. 7. He curled the hair from the front hairline and then back using a 3/4″ curling iron (for the first two sections) to create a pronounced wave. 8. Gray progressed to a 1″ iron for the remaining set sections, including the ponytail. 9. Then, he misted the entire set lightly with Moroccanoil Luminous Hairspray Strong. 10. He released the set, and combed it out starting at the crown, and allowed some loose pieces to fall free. 11. 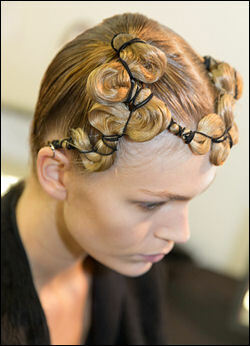 He backcombed the top section lightly for a fluffy, feminine effect, concentrating on the wave through the front area. 12. The remaining loose lengths of the hair were wrapped around a pin-tailed comb, with the tip inserted vertically into the top of the braid, to hold the chignon above the reverse-braid. 13. Fine wisps of hair were then brushed loose to soften, free, and modernize the look. 14. Gray used a fork comb to break up the edges of the set, and gave the style a final misting of Moroccanoil Luminous Hairspray Strong to hold it in place. 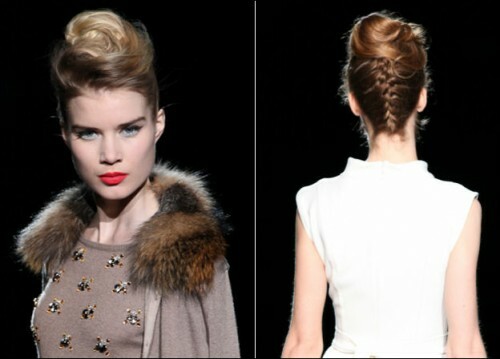 Stylist, Orlando Pita, created sleek, modern and graphic 40’s inspired hair looks for the Carolina Herrera collection. 1. He sprayed Moroccanoil Heat Styling Protection throughout the hair and for models with fine hair, he also worked in Moroccanoil Volumizing Mousse, and then blow-dried hair straight. 2. 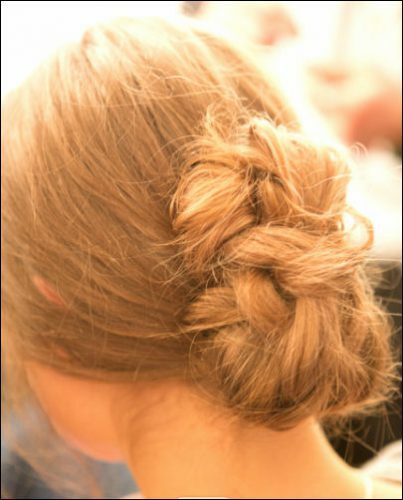 Pita then applied Moroccanoil Hydrating Styling Cream to help make the look sleek and perfect. He applied a bit more to the roots and top of hair since he was creating the style so close to the head. 3. He parted hair down the middle to create two sections, and a third, which started behind the ear, up to the crown, and down to behind the ear on the other side. 4. After lightly backcombing (about 2 inches from the root) for models with fine hair, he took each front part, rolled it very tightly, and pinned the roll at its seam as well as behind the ear. 5. Then he took strands remaining at the end of the rolls, twisted and crisscrossed them at ear level and pinned to serve as a focal point to secure hair that would be rolled up from the remaining back section. 6. Pita raised the back sections slightly above the nape, rolled them tight but a bit wider than in the front, then tucked them in and pinned. 7. He wet his fingers with a little Moroccanoil Hydrating Styling Cream and applied it to flyaways and loose strands, so that the hair stayed sleek and perfect. 8. He finished with a very light misting of Moroccanoil Glimmer Shine Spray for added shine. 1. She began by prepping hair with Aveda Pure Abundance Style Prep to give hair some texture and grit. 2. Then she blow-dried hair straight. 3. Beenders created a clean center part from the forehead to the nape using a tail comb. 4. She made an inverted fishtail braid on each side of the head, beginning at the crown and working to the back of the ear. 5. She secured the end of each braid with an elastic band. 6. Beenders tamed flyaways with Aveda Air Control Hair Spray. 7. She then added some fullness by gently massaging braids. 8. Then she folded the braids over one another across the back of the head, just above the nape, in a crisscross fashion. 9. She tucked ends under and secured with bobby pins. 10. She finished with a misting of Aveda Air Control Hair Spray. The collection takes a dark look at America’s first settlers, from Salem witchcraft to its colonial landscapes. Antonio Corral Calero, Moroccanoil Artistic Director, created styles were flowing yet geometric, feminine yet strong, and strongly influenced by the darker, more mysterious iconic imagery of the colonial period. 1. He first used Moroccanoil Treatment to improve condition and then applied Moroccanoil Hydrating Styling Cream to make hair more manageability during the styling process. 2. Then he lightly sprayed Moroccanoil Heat Styling Protection to protect strands from the intensity of the hairdryer and flat iron and to provide a healthy-looking hold. 3. Calero applied Moroccanoil Volumizing Mousse from the ends up, starting at the back, to the top of head, and throughout the sides. 4. He blow-dried hair with the Moroccanoil XLPRO Paddle Brush, with the bristles swept up into the hair at the crown to raise them for added volume. 5. He then applied Moroccanoil Styling Gel (available late spring) to his comb and applied to the roots in horizontal sections starting mid-head, sides, and crown which allowed him to create shaped height. 6. He then used the paddle brush to lift strands, directed the flow of the blow dryer to the root upwards, and then brushed hair back down for smooth volume. 7. Starting mid-head in the back then to the sides, he flat-ironed hair straight, sleek and close to the head to contrast the height on top. 8. Calero gently backcombed hair at the crown to create a structured, volumized, squared shape. 9. To unify the look and create a rich, natural, consistent shine throughout the hair, he held the style in place with Moroccanoil Luminous Hairspray Strong. Inspired by the beautiful and very feminine lines, colors and shapes of the designs, stylist Antonio Corral Calero created looks that were visually rich yet modern and light in feeling and flow. 1. First, he applied Moroccanoil Treatment, which helped detangle the hair. 2. Then, he brushed the hair out, leaving each model’s natural texture intact, and created a deep, long side part that went up to the crown. 3. He sectioned the hair from ear to ear, leaving it free in front and tied the rest of the strands back into a simple ponytail placed low on the nape and held with a transparent hairband. 4. Calero combed the hair from the parted side, then backcombed it to create a feeling of lightness, and brought it over the ear, adding it into the ponytail and held with another hairband. He did the same on the other side. 5. Next, he slightly backcombed the hair in the ponytail, made a loose braid and swirled it around and into itself to create an airy chignon that floated from the nape of the neck to mid-head. 6. For a flowing winged effect alongside the chignon, he gently lifted hair near the ear with the tip of his comb to create contrasting volume and width at the back of the style. 7. He used Moroccanoil Luminous Hairspray Medium for a natural and soft look, and to prevent flyaways and loose strands. 8. He finished with a very light misting of Moroccanoil Glimmer Shine Spray. The inspiration for the Katya Leonovich collection was the concept of the “chrysalis,” taken from the symbolism of the spun-silk cocoon from which the butterfly emerges. 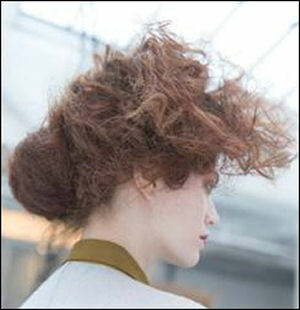 Antonio Corral Calero, Moroccanoil Artistic Director, created elegant, ethereal looks with unique contrasting textures for the show. The messy chrysalis-like halos were inspired by the feminine turbans of the 20’s, and were contrasted by the straight smooth lines of hairstyles worn by Japanese Samurai. 1. First, he applied Moroccanoil Treatment (Moroccanoil Treatment Light on fine or lighter haired models) from ends to roots, to detangle and smooth the hair. 2. Then he lightly sprayed the hair with new Moroccanoil Heat Styling Protection to protect the hair from the intensity of the hairdryer and flat iron. 3. Calero applied Moroccanoil Volumizing Mousse throughout the hair, working in 2″ sections from roots to ends. This time, he gently massaged the mousse into the hair with his fingers to liquefy the product, so it would penetrate more deeply into strands. 4. Blow-drying straight with the Moroccanoil XLPRO Paddle Brush, he left some volume in the crown area while flattening hair at the temples and in the back, then flat-ironed and sprayed Moroccanoil Luminous Hairspray Strong to hold the shape. 5. In order to create the turbaned design, he made a faux braid– he parted the hair, then crisscrossed 2″ horizontal sections (starting at the nape) from the left side to right, and over the top of the head, and then pinned at the opposite ear. He duplicated the same technique from right to left to overlap the hair into an unbroken halo effect. 6. After the effect was completed, he texturized the wrapped braids by pinching them with his fingers so that they had a rougher, more modern texture and did not look flat to the head. 7. He finished by spraying the look with Moroccanoil Luminous Hairspray Strong for a hold that had natural movement and let the hair flow. 1. She first made a center part, creating two sections on each side of the head. 2. Then she drenched hair with Aveda Phomollient Styling Foam from roots to mid-length and with a Mason Pearson comb each side up into a high ponytail with one pony nearer to the forehead, and the other behind the ear. 3. Next, she used about an arm’s length of millinery elastic to anchor each of the ponytails in place. This elastic grabs the hair so you don’t have to worry about slippage. 4. Once tied taut, she wrapped the loose ends of the elastic in a criss-cross fashion around the ponytail, working from the base to the ends, effectively “corseting” the hair. 5. Beenders then pulled hair gently from in between the elastic cord to create S-shaped waves, and then smoothed out flyaways with Aveda Control Force Firm Hold Hair Spray. 6. She overlayed the ponytails on top of the head, directing the ponytail that sat closer to the face down the side of the head so that it snaked along the hairline. She then secured with bobby pins and U-pins. If the hair was long enough, she looped underneath the ear. 7. She directed the other ponytail that sat further back on the head forward along the parietal ridge, which is about an inch above the ear, securing with pins. Again, she allowed the hair to snake along the hairline above the forehead, tucking the ends under the first ponytail. Together the ponytails converged to create a wavy S-shaped form. 8. She finished with Aveda Control Force Firm Hold Hair Spray. 1. The starting point was a center part, which was not to be too severe. It needed to be a bit messy to reflect the type of girl in mind – with hair looking languid and softly put through. 2. He prepped hair by first wetting it down, and then he applied Moroccanoil Volumizing Mousse, working it all the way through and to the ends. 3. Once this was done, he dried it off delicately with a hair dryer. The important thing here is that he used just the hands to twist the hair lightly in big sections. This gave the hair a really lovely natural foundation and movement. 4. After hair was dried, this soft movement was further emphasized at the front and around the face, and he used a big curling iron to create a bit more of a wave. For some models, he used Moroccanoil Luminous Hairspray Medium to hold interesting textural motion in place, without seeming as if there was any product in the hair. 5. For those with shorter layers at the front, he added in a few extensions to give length, since an essential part of the look was to have movement flowing over the face and eyes. 6. Hanlon separated the hair’s texture, especially at the ends, so that it interacted with the face and fell off the shoulders. Depending upon the natural hair type of the model, he used either Moroccanoil Hydrating Styling Cream or Moroccanoil Dry Scalp Treatment (in a different way) to separate clusters of strands. 7. Lastly, he lightly sprayed the look with Moroccanoil Luminous Hairspray Medium for a moveable hold.